Here at Make Water Pure, we have become Europe’s leading suppliers of at-home water distillers, distributing stainless steel water distillers up and down the country and supplying the EU with pure distilled water. With our public water supply now containing thousands of chemicals and toxins in every single mouthful, more and more people are choosing to distil their water. The reasons for distilling water range from health and wellbeing to longevity within our home steam appliances. The question is however, when it comes to counter top water distillers, which one should you purchase? There are indeed a lot of different water distillers on the market, supplied by a number of different companies but Make Water Pure are the leading suppliers for one reason and that’s simply because we’re the best. 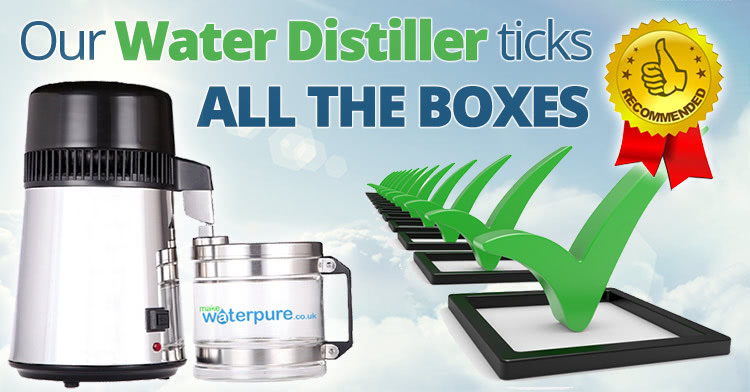 Here we look at the numerous reasons why thousands upon thousands of people in and outside of the UK choose to purchase their water distillers from us and no one else. Our water distillers are quite possibly the best quality water distillers on the market. Manufactured from 100% stainless steel, they’re solid, strong and are able to withstand a high amount of use. Despite our excellent prices, quite often beating our competitors who are selling machines of a similar quality for a lot more, our stainless steel counter top water distillers are guaranteed to give you pure, fresh distilled water for years to come. One look on the Internet will show you that not only are we cheaper than all of our competitors but we’re also often cheaper than companies selling machines of a much lower quality too. Add in our free UK delivery and one year warranty and we know you’ll be hard pushed to find a better value deal anywhere else in the UK. Our machines also offer great value in terms of running costs too. Compared with buying bottles of distilled water, our machines are far more economical by far and due to their high efficiency, they use the minimum amount of electricity. Aside from the delivery being free for all orders over £99 to anywhere in the UK, it’s also a super quick service too. In general, your order will take around two days to arrive however some may take up to five working days. In comparison to a number of other companies, we think you’ll agree this is a rather quick and efficient delivery. Our machines are incredibly efficient. While some machines may take up to five or even six hours to create four litres of distilled water, our machines take less than four which means you have distilled water available much sooner than you would if you chose one of our competitor’s models. The high efficiency of the machine will also reflect in it’s running costs as it uses a lot less electricity subsequently saving you even more money. Our at-home water distillers couldn’t be easier to use. The unit itself requires no plumbing whatsoever so as soon as you receive delivery of it, it’s essentially ready to go. All you need to do is first pour tap water into the boiling chamber. Once full, put it on your worktop and dry before plugging it in and then simply press the start button. That’s all it takes to set the machine to work and begin distilling your water. The unit is incredibly safe too as it automatically switches off after your four litres of water has been made. The heating element inside the chamber is also enclosed to minimise heat loss which means it produces even less heat than a boiling kettle minimising any chance of heat becoming a problem. Whilst some machines feel like they require a room of their own, our water distillers are space saving and actually portable. They are counter top water distillers, which means not only will they fit on the average sized worktop but they can also be picked up and moved should you want to change its position in the house. This makes it ideal should you decide to take it with you on a weekend away for instance. The water distillers are very easy to maintain in that they need only the minimum amount of cleaning. Although we recommend you clean it before each cycle, it’s simply a case of giving the filling tank a quick sponge with warm soapy water. If you do notice a few stubborn areas of residue then we advise using half a cup of white vinegar in warm water and leaving it to work its magic for an hour or so. This may only be necessary once in a while for those areas with extremely hard water however we also have cleaning crystals for this too. Unlike a lot of other machines, our units come in a choice of either stainless steel or white giving you the option to match the machine to the décor or appliances in your kitchen. This means that it won’t stand out or appear unsightly. Instead it will simply blend in on your worktop ready and waiting for you when you need it. On top of this, the Make Water Pure collection jug is made of glass. Yet again, another example of quality and great looks in our product. If you’d like more information on our quality water distillers and how you can get your hands on one then please, contact us today for more information.